California has seen more than its fair share of horrific wildfires, but none can compare to the Camp Fire, now the largest and most deadly fire in California history. The fire claimed at least 85 lives, demolished entire towns, sent tens of thousands of residents fleeing, and left many of them – including 86 members of IBEW 1245 – homeless right before the holidays. Brian Clarke captured this photo of the smoke plume before the fire reached Paradise. The fire spread so quickly and with such fortitude that it caught most residents completely by surprise. For 10-year IBEW 1245 member and Paradise resident Brian Clarke, that fateful day started out much like any other. Clarke, who works in vegetation management for Trees Inc, went into work around dawn, as he usually does. But as he was leaving the yard around 7:30am to get to his work assignment, he noticed a large plume of smoke on the horizon. 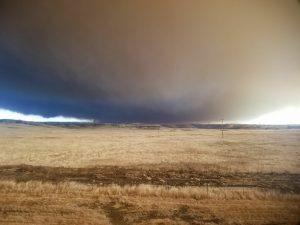 After making some calls to a family member and the Butte County sheriff, he learned that the fire was encroaching on the nearby town of Concow, and the entire area in and around Paradise was being evacuated. He quickly reached out to his general foreman and made plans to evacuate. Shortly thereafter, Clarke got a call from his wife, who was crying as she struggled to round up the family pets. She had collected three of their four dogs, but was unable to get the last one, a blind goldendoodle. So Clarke and his son, who also works with him at Trees Inc, headed towards home on an animal rescue mission. Clarke, his son and the pets narrowly escaped the fire, and there was a point in time when he wasn’t sure if they would make it. Within a matter of hours, Clarke’s primary residence, as well as his rental property, would be reduced to rubble. The weeks since the fire have been tough for the Clarkes, but they feel fortunate to have received assistance from friends, co-workers and others, and they also appreciate the support they’ve gotten from both Trees Inc and IBEW 1245. “The union’s been great. I called up my union rep, Ray Banfill, right away, to tell him what was going on, and he showed us quite a bit of support,” said Clarke, noting that several of his Trees Inc coworkers were also displaced by the fire. Clarke’s employer has been extremely understanding of the situation and provided them with hotel rooms, gift cards, and flexibility at work so they can get their affairs in order. Clarke returned to his tree trimming job in Oroville just a couple weeks after the fire, and has found that being back on the job has been surprisingly cathartic. 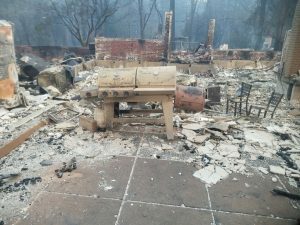 The fire may be contained, but the aftermath of the blaze is still wreaking devastation across Butte County. 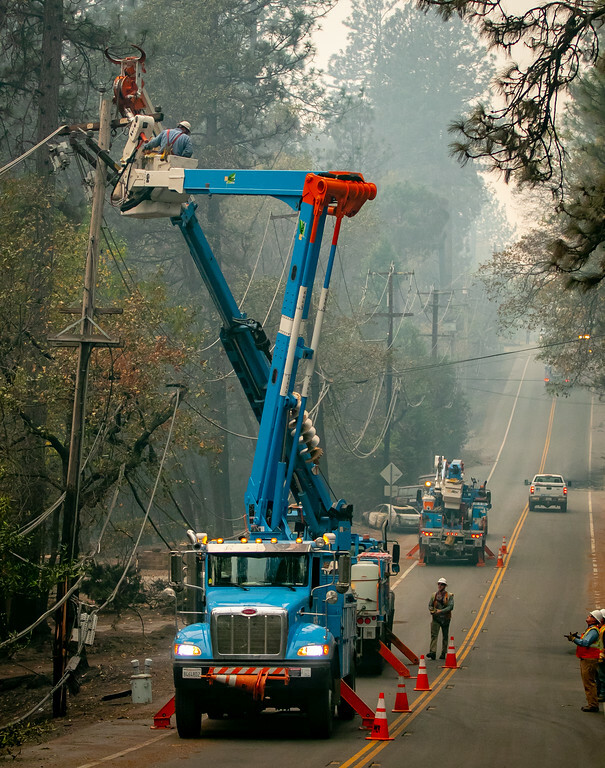 As utility first responders, hundreds of IBEW 1245 members from PG&E have been on the scene from day 1, capping gas lines, cleaning up downed wires and transformers, and beginning the arduous gas and electric restoration process. 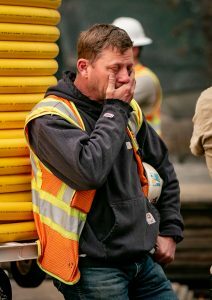 For 15-year IBEW 1245 member Steve Lange, who grew up in the town of Paradise, working in the ruins of his beloved hometown has been exceptionally emotional. When the Utility Reporter caught up with Lange in Paradise just days after the fire had leveled the town, he was clearly shaken up. But he didn’t let his emotions get in the way of the job he had to do. 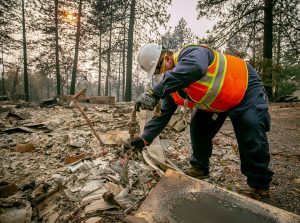 Lange was among the dozens of gas members that PG&E quickly dispatched to address the immediate safety hazards, in an effort to protect the first responders and others who were on the scene from utility hazards created by the fire. 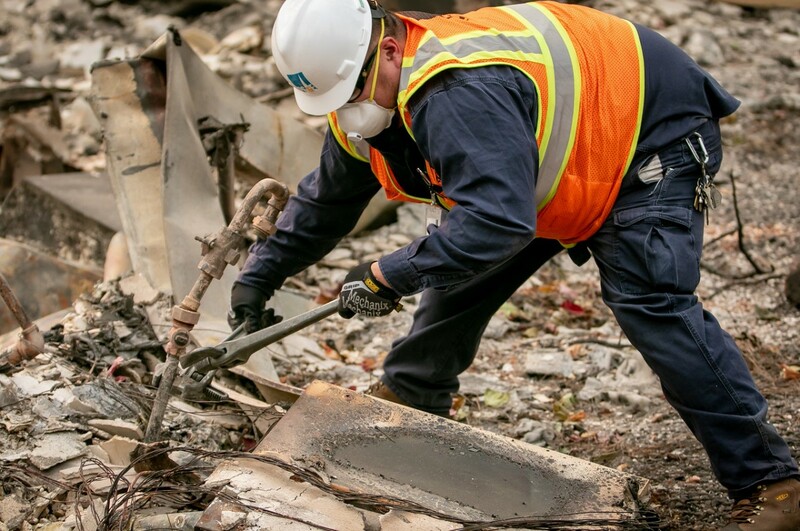 With so much damage, the task can seem insurmountable, but the expert workers from PG&E have handled the situation with professionalism and aplomb. “Right now, we are assessing the damages to the facilities, documenting what house are still up, what services are damaged, and what services are not damaged, so later on we might be able to restore gas to the folks that are still able to receive our services,” Gas Service Representative Phuong Tran told the Utility Reporter on Nov. 12, about 72 hours after Paradise burned down. Like many PG&E employees, Tran is no stranger to fire zones. In 2017, he spent almost a month working in Santa Rosa and Napa following the wine country fires. With the images and experiences from those fires still etched in his mind, he never imagined that it could get worse than that – until he arrived in Paradise. “I said at that time that I would never forget [the aftermath of the wine country fires], that it would probably affect the rest of my life. 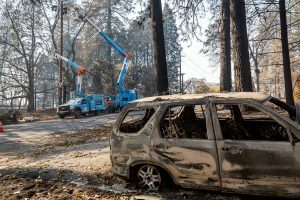 But this is far worse than last year’s fires, from the totality of the damages we’re seeing,” said Tran, who works out of PG&E’s Fremont yard. Even with their vast fire experience, the PG&E crews were blown away by what they encountered and had to work around. They face exceptionally hazardous driving conditions, with lines and trees down across nearly every roadway. They came across transformers and other equipment perilously dangling in trees. They had to contend with some of the worst air quality ever recorded in the United States. They crossed paths with countless terrified animals – both wild and domesticated – who were hungry, confused, and left with nowhere to go. And they had to ensure ample communication and coordination among the hundreds of first responders, as well as the 80+ mutual aid crews and contractors, in order to keep everyone safe. The work is taxing, the days are long, the conditions are incredibly difficult, and every pile of rubble is a painful reminder of the lives and homes that have been lost. But the 1245 members on the scene are committed to doing all the can for the communities and residents impacted by the fires.